Can Egypt bring Cleopatra's palace back to life ? Some of the world's most exciting sunken treasures could soon be on view after Egypt confirmed plans to build a giant underwater museum in the Mediterranean. But as preparation begins on the site of Cleopatra's Palace in Alexandria, funding and technical problems are proving as divisive and controversial as the famed queen herself. Ancient Alexandria was one of the world's great centres of civilisation, and since excavations in the eastern harbour began in 1994, divers have unearthed thousands of historical objects. These have included 26 sphinxes, several vast granite blocks weighing up to 56 tonnes each, and even pieces of what is believed to be the Pharos of Alexandria lighthouse, one of the seven classic wonders of the world. Remnants of Queen Cleopatra's palace complex are also submerged beneath the waves, after the island on which it stood fell victim to earthquakes in the 5th century. Now ambitious but controversial plans are under way to open up this unique site via an immersed fibreglass tunnel which would enable close-up viewing of the underwater monuments. 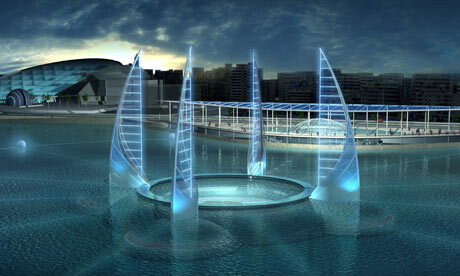 The designs were drawn up by the French architect Jacques Rougerie, a veteran of water-based construction projects, and have been backed by the United Nations cultural agency Unesco.